To have access to the structure architectural barriers have been removed in order to allow admittance to everyone. Front desk open 24 hours a day and staff always at complete disposal. 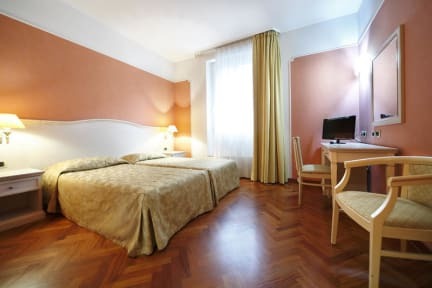 The Hotel provides a wide and elegant hall with bar open till 23.00, an internet corner and a TV room to relax.Corner with free magazines and newspapers. Structure exclusively for non smokers.Two meeting rooms, one for 13 people and the second up to 50 people, provided, on request, with slide-projector overhead projector, screen and blackboard with removable sheets. 47 rooms, single, double/twin, triple and suite. We provide cot for children up to 6 years old (99 cm x 59 cm), 15€ extra per night. 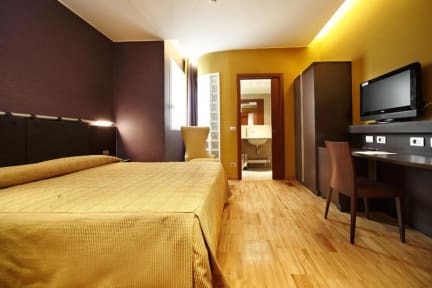 Every room is equipped with double glass windows, minibar, air conditioning, private bathroom (shower and/or bath tub), toilette kit, hair dryer, telephone, parquet or moquette on the floor, connection Plug & Play for internet, safety box, satellite colour TV, wake up call. Clean, close to the main station, good Internet, TV wasn't working properly, air con is more like fan but it works and the room wasn't hot, friendly receptionists, lots of traffic, tram and trains noise late at night and first thing in the morning so might be a problem for light sleepers, there's a fringe in the room with beer, water, coke at reasonable prices, very safe around the hotel just need to me watchful of your belongings like any city. Overall a good experience. Got lost from the train station and was refused a taxi due to the location being so close to the station. Only suggestion is to provide more detailed instructions on the booking confirmation. Decent place to stay. Fair price. 24 hour check in. Super close to the train station. Area isn't the best but is located very close to the main station. Secure room with a safe for valuables. Good location next to the train station. Great value for the money. Our room had AC which was amazing considering we were there in middle of summer. Not the nicest or most enthusiastic of staff, and the wifi was a bit spotty. Strangely, they wouldn't let us keep our key whenever we left the hotel. We had to turn it in to the reception desk each time we left. Otherwise, if you're just staying for a night or 2, this is a great value for the money. This hotel has the rudest staff Ive ever seen. They never smiled and always sounded like they didnt want to be there. When we tried to pay in the evening in cash the guy on reception said he couldnt be bothered to print a receipt and to come in the morning instead. Also the hotel room wasnt clean. It reaked of cigarette smoke and the shower had mould in it. They claim to be a 3 star hotel but Ive seen better 1 star hotels than this.